This was Third World's third studio album, and, following on from the appealing "96º In The Shade" is further demented the switch from pure, rootsy reggae to a fusion of reggae and soul. That said, there was still a solid roots vibe and message to the band's material. As always with the early Third World albums, it had a great cover. "One Cold Vibe (Couldn't Stop Dis Ya Boogie)" begins with a little bit of prog rock-style keyboards before it kicks into an airy, breezy, crystal clear percussive easy reggae groove. Lead vocalist Bunny Rugs had a great, laid-back and melodious voice. It was perfect for this type of soulful, almost jazzy reggae. 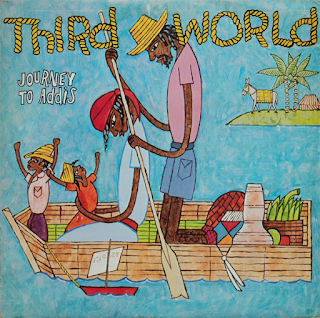 There was still a bit of Rasta message, however, spiritual matters were never far from the surface in Third World's music, but it was never hard-core roots. The rhythms, though, are incredibly intoxicating. "Cold Sweat" gets into that effortless groove that just makes you want to be in the Caribbean under the sun. The percussion is just so good. So clear and sharp. Mix that with a big, rumbling bass and you have a great sound. "Cool Meditation", as the title would suggest, ploughs the same furrow. Rugs's voice is higher-pitched on this one, but wonderfully delivered. It also features some Stevie Wonder-style harmonica, unusual for a reggae track. 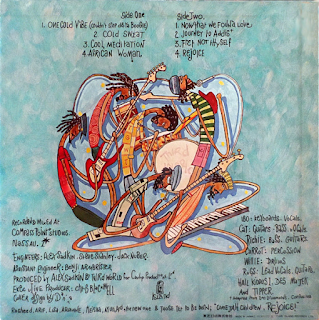 "African Woman" is a slow burner with an almost funky bass line and a deep, thumping rhythm. Some lovely guitar swirls around this track. "Now That We've Found Love" was, of course, their massive "fusion" hit - combining easy skanking reggae, soul vocals and disco vibes, it appealed to a wide variety of record buyers. This wasn't surprising, it is a great track with an infectious summery feel and an instantly memorable, singalong hook. "Journey To Addis" is a sumptuous instrumental, with some funky wah-wah guitar, killer lead guitar and big rubber band bass. This a great stuff, that bass line is superb, as indeed are the horns. UB40 surely took a lot of influence from this. "Fret Not Thyself" is the album's first true Rasta devotional, with "trust in Jah Lord..." lyrics. "Rejoice" is a socially conscious, soulful number also with Rasta sentiments to finish what was a positive, feel-good album. Recommended.